Before the Lincoln Highway was rerouted to cross the Westinghouse Bridge in 1932, Dixon Av followed the valley from East Pittsburgh toward McKeesport. The Lincoln Hwy had descended into the Turtle Creek Valley via Greensburg Pike, but the steep hill, sharp turns and heavy traffic led to the more direct bypass via what was the longest concrete arch bridge of its time. One of the few cross roads in this valley is Irishtown Rd; indeed, the 1876 atlas shows 3/4 of the two dozen families living there had Irish surnames. The tunnel appears to have been built to allow Dixon Av to pass through the deep fill which allowed the Lincoln Highway to cross the head of the ravine at Irishtown. The tunnel was built as a two lane structure and would have had one lane in each direction. As part of the Model Cities renewal program in the Turtle Creek valley in the 1970s, the Tri-Boro Expwy was constructed in 1974. Part of the Tri-Boro replaced Braddock Av below the Westinghouse Bridge and connected to a four-lane divided replacement of Dixon Av and Versailles Av (East Pittsburgh-McKeesport Blvd) which had been built in 1972 to connect the lower valley with the then new Eastland Mall. 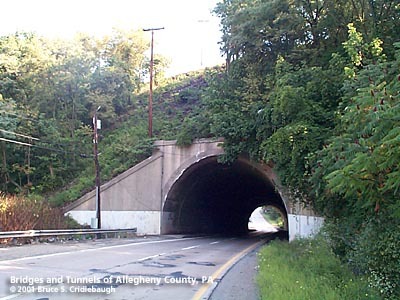 The southbound lanes of EPMcK Blvd continued to use the 1930s tunnel through the embankment, while the northbound lanes were brought into the valley at a higher elevation allowing a more conventional bridge to carry the Lincoln Highway over those two lanes.